In a joint statement on July 27, top Republican policymakers in the House and Senate, along with President Donald Trump’s top two officials responsible for tax policy, re-upped their commitment to passing “comprehensive tax reform.” With the help of business groups and conservative organizations backed by the Koch brothers, they plan to ramp up their campaign for tax reform over the Labor Day weekend. The language that Republicans are using to push these proposals — “make taxes simpler, fairer, and lower” for American families — sounds appealing. But the policies on their wish list are almost entirely tax cuts, and almost all of the benefits (99.6 percent under House Speaker Paul Ryan’s plan) will go to the top 1 percent of taxpayers. A real effort at tax reform would focus on closing loopholes that benefit the wealthy and well-connected. It would raise the revenue we need to strengthen Medicare and Social Security and maintain quality schools, housing, and roads. What Trump and Republicans have in mind is the opposite. Here’s a list of the new tax breaks for the wealthy and corporations contained in the Trump and House GOP tax plans. At the top of the list is a dramatic cut in the corporate tax rate. Donald Trump wants to reduce the rate from 35 percent to 15 percent, which the Tax Policy Center estimates would cost a staggering $2.2 trillion over 10 years (that’s more than three times what the Supplemental Nutrition Assistance Program, formerly known as food stamps, would cost over the same time period). Congressional Republicans proposed a slightly smaller reduction to 20 percent in their 2016 plan, which the Tax Policy Center estimated would cost $1.8 trillion. The standard justification for these cuts is that they’ll boost business and create jobs. During the 2016 Presidential debates, Trump vowed the cut would “be a job creator like we haven’t seen since Ronald Reagan.” The catch is, US corporations’ tax burden is already comparatively lower than our major trading partners, and US multinationals take advantage of so many loopholes that their effective tax rates are nearly half the statutory rate. Corporations as a whole are actually contributing less to total taxes than they did in the early 1950s: Their share of total tax revenues has dropped from 33 percent down to roughly 10 percent of total revenues. Right now, US corporations pay the US corporate income tax on both domestic and foreign profits, but they can put off paying the tax on their foreign profits by keeping them offshore. This also gives them the incentive to shift profits they earn in the United States offshore. Trump has proposed moving to a territorial tax system, which would eliminate the tax on foreign profits altogether. That way, US corporations would only owe taxes on profits made in the United States and no tax at all on their foreign profits. And the incentive to shift domestic profits offshore would be even greater. Trump and the House GOP have proposed capping the tax rate on pass-through business profits that individuals receive. Trump calls for capping the rate at 15 percent, while the House GOP has proposed a 25 percent rate. 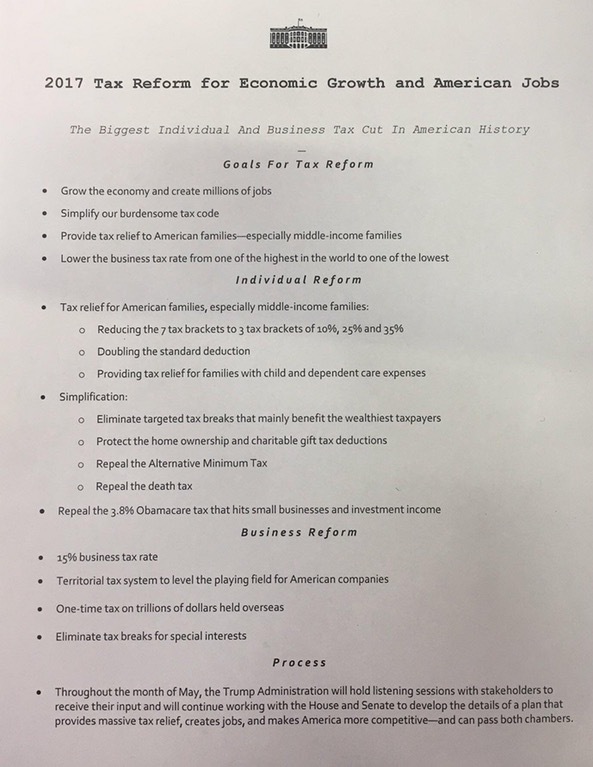 Since that would significantly lower the tax rate for business owners who are currently in higher tax brackets, this proposal would cost between $2 trillion (for Trump’s proposal) and $412 billion (for the House GOP proposal) over the next decade. Trump and the House GOP claim this tax cut is for “small” businesses, but most actual small businesses won’t benefit much, if at all, from this change. Over 90 percent of pass-through businesses already fall in the 25 percent tax bracket or lower, and over 50 percent currently fall in the 15 percent bracket or lower. The people who will benefit from the change are very wealthy business owners — such as hedge fund managers, lobbying and law firms, and big businesses — that are organized as pass-throughs but compete with large corporations. This proposal would also likely create a new avenue for wealthy individuals to avoid taxes, since they could avoid tax by re-characterizing their high salary as business income that would qualify for the lower rate. This can be accomplished, for example, by creating an LLC to receive their salary, then paying the preferential tax rate on the “profits” they receive from the LLC. Both Trump and the House GOP have made a lot of noise about simplifying the tax code for working Americans by reducing the number of tax brackets. Trump’s most recent proposal calls for individual income tax rates of 10, 25, and 35 percent, while the House GOP plan calls for rates of 12, 25, and 33 percent. Depending upon where the rates kick in, there may or may not be any benefit for those who currently fall in the 25 percent tax bracket or lower. In fact, some moderate-income people may pay more tax than under current law, since other “simplifying” proposals include eliminating personal and dependent exemptions. Millionaires, on the other hand, would benefit in two ways. The top rate, which currently applies to all income above roughly $400,000, would be cut from 39.6 down to 33 or 35 percent. For someone with $1 million in income, this could be a tax cut of roughly $30,000 or more. They would also get a secondary benefit from the lower rates on portions of their income that fall in the (newly reduced) lower-rate brackets. Instead, the GOP is clinging to the premise that tax cuts will spur huge economic growth that will somehow trickle down to average American workers. History tells us they won’t. It also tells us that tax cuts of this size will lead to budget-busting revenue losses — and that could threaten funding for Medicare, Medicaid, education, and many other foundations of an economy that works for everyone. Alexandra Thornton is the senior director of Tax Policy for Economic Policy at the Center for American Progress.